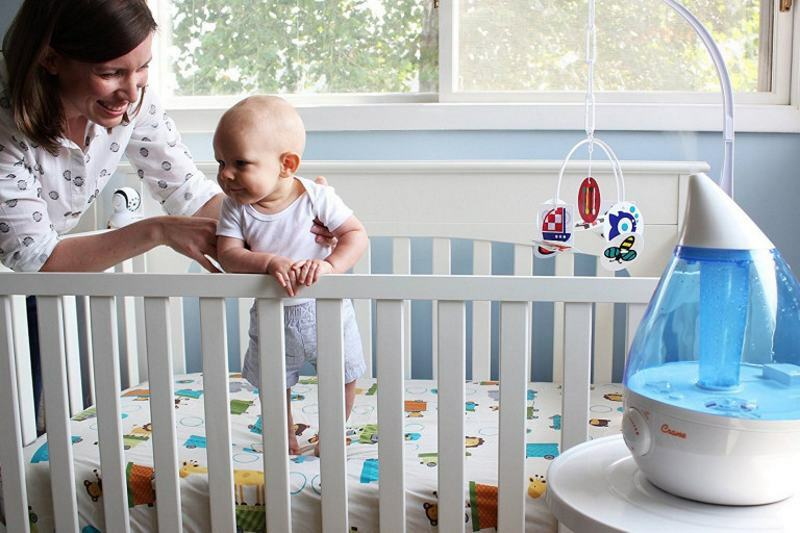 Humidifiers are great and can really make a big difference for both your comfort and health. However, it’s a bit confusing sometimes when trying to figure how use them. What’s even more annoying is how little information there is out there to help. Can you potentially get bad results or even feel worse if it’s too close to your bed? And what about sleeping – how will it affect that? 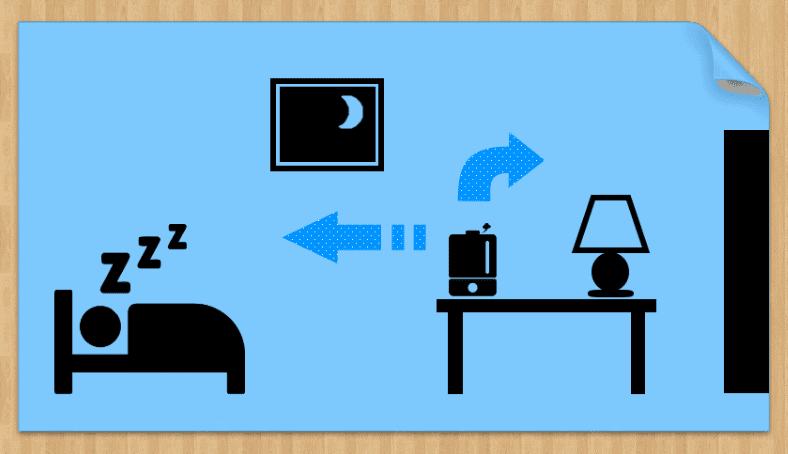 If you’re wondering how close you should put a humidifier to your bed, I’ve got some great info that’ll help. 1. Where should you place a humidifier? 2. Should a humidifier be on the floor or a table? Where should you place a humidifier? As it turns out, there isn’t a perfect place to put your humidifier. I can, however, give you some general guidelines that will work for nearly everyone – including your bedroom. We don’t recommend placing a humidifier too close to your bed or other occupied areas but not for the reasons you might think. In fact, during cold and sinus congestion times they can actually be very helpful next to your bed! I’ll explain more as we go. Ideally I recommend keeping your humidifier several feet from your bed on a good, flat surface above the floor that’s not harmed by water droplets or spills. 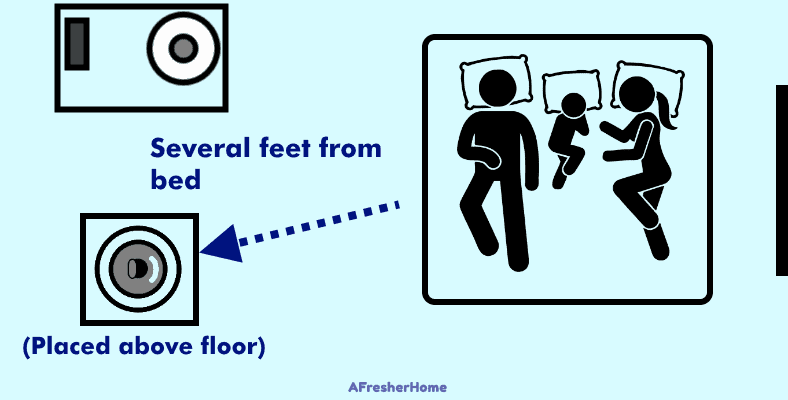 Additionally, if you’re suffering from severe congestion you might find it helpful to keep it near the bed temporarily. As I mentioned earlier, a good rule of thumb is to keep a humidifier several feet from your bed and other large pieces of furniture under normal conditions. If you’re suffering from severe congestion, sinus problems, or other similar cold or flu symptoms keeping a warm mist humidifier near the bed is helpful sometimes. That’s because warm mist products create a warm air mist in the form of steam which have a relieving effect similar to a hot, steamy shower. Heavily moist, warm air helps to open nasal and sinus passageways. When you’re sick having one located next to your bed is not only accepting but also you can, at your choice, directly inhale the gentle warm mist for relief. When trying to sleep, it’s sometimes again best to have a humidifier located far away from your bed. While they normally won’t harm anything if too close, it’s better to have them located where moisture can distributed well and you won’t be around too much. Additionally, some make sounds while operating that could wake light sleepers. If you’re a heavy sleeper you’re not likely to have the problems waking up when sounds occur as I do. However, you should know that some humidifiers create some interesting sounds occasionally during operation. For example, when opening the water tank’s valve to retrieve more water, my Vicks model makes a “gurgling” sound. Other models may have a slight bubbling or very low-volume sound from the movement of air. In general, most quality humidifiers are very quiet and aren’t very likely to disturb you during sleep if placed farther away. Not only that, but as a general rule I don’t recommend having a strong source of moisture very close to you when sleeping as it’s potentially bothersome to your nose & throat. Additionally, as our body temperatures fluctuate during sleep, you could become uncomfortable during your rest time as well. As I mentioned earlier, don’t place humidifiers in direct sitting sunlight like near a window. It will encourage the growth of bacteria and even algae which will speed up how quickly the water tank spoils. Maintenance is always required. 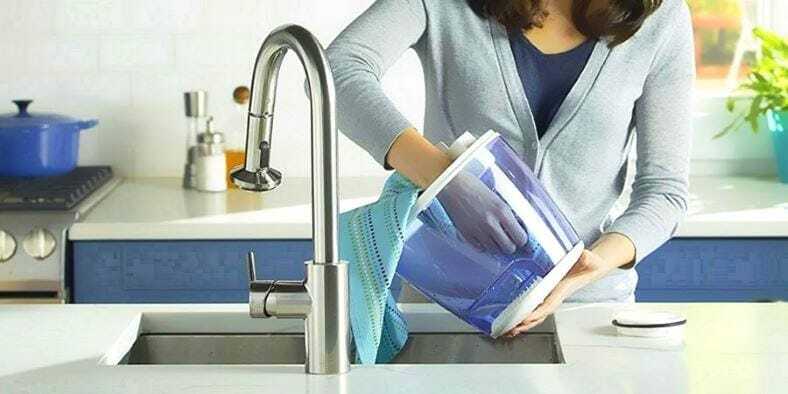 Periodically (often 1 time week or once every 2 weeks) clean the tank thoroughly with white vinegar mixed with water and a soft cloth if needed. I get great results using distilled water in mine as it helps keep buildup to the least amount of work possible. Should a humidifier be on the floor or a table? You can use humidifiers on either a sturdy table or the floor, although at least about 2 feet from the floor is recommended. Humidity will still distribute evenly throughout a room over time. Product manufacturers and I both recommend you don’t use a humidifier alone without something to protect the surface from spills or water droplets. Placing one at least 2 feet above the floor is ideal. 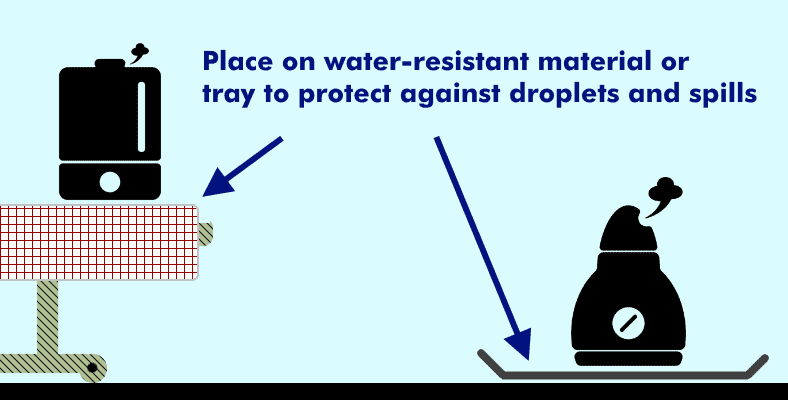 In this case use a sturdy table that isn’t in danger of tipping with a full and heavy water tank. You also don’t want anyone accidentally tipping one over so be careful where you place it to avoid accidents. 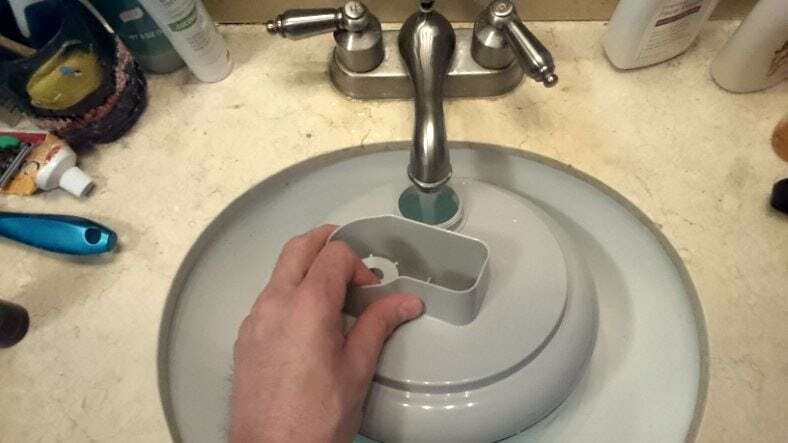 Ideally, however, you’ll want to use them with some type of tray or protective material placed underneath as you’ll find that it’s very easy to accidentally spill water when replacing the tank. In my experience it’s a common problem although it depends greatly on the design of your particular product. Not everyone has a water-resistant table to use so find an item that’s water-resistant. Pick one that’s larger enough to cover the area around the base by about 1/2 – 1 feet in size as a rule. 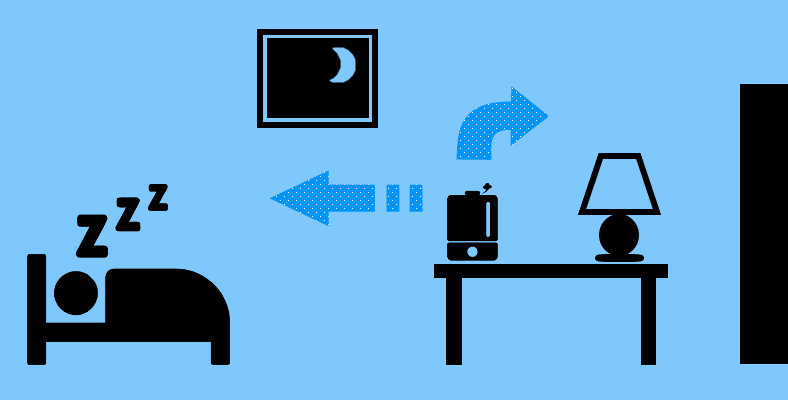 You can, in fact, use a humidifier on either the floor or a table if you must. They’ll still work well, just not as fast and efficiently. However, in that case, never place them on carpet it will trap water and potentially lead to more problems. 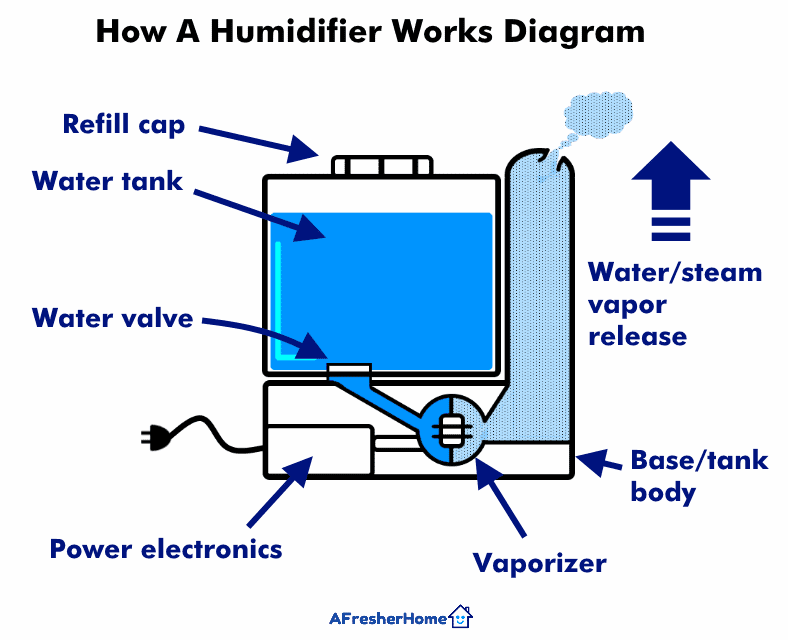 Illustrated diagram of a common humidifier. Although the particular details vary from model to model, all have the same basic job: liquid water, stored in a tank, is changed into a very fine mist that rises in the air. This, in effect, increases the humidity level safely and comfortably. Simply put, a humidifier works to convert liquid water into a fine moisture which is released into a room to increase the humidity. While not all need electricity to do so, the most common (and often the most effective ones) use power from a standard electrical outlet to run. Of these, thermal (warm mist) and ultrasonic (cool mist) types are now the most commonly sold. Both have pros and cons I’ll share further below. The vaporizer changes the liquid form of water into a fine mist that rises through an exit passageway and out a nozzle into the room’s air. This adds moisture (humidity) to the room’s air and improves comfort, health, and relief from low-humidity conditions. Shown: Filling a cool mist humidifier’s water tank in my home during testing. Nearly all (except, for example, evaporative models) work the same: remove the tank when it runs dry and fill it with clean water. Note that mineral-heavy water is not recommended! Ultimately, you’ll only need to refill a water tank periodically as it takes a number of hours for a tank to become empty in most cases. Some typical time windows are about 9 hours to 24 hours between running out. The amount of time it takes depends on both the output setting of the humidifier and the tank size of the model you buy. For that reason, it’s isn’t always best to buy the cheapest! If you’re like me and don’t like hassle or having to keep up with something, spending a few more dollars for a model with a larger tank is well worth it! This is especially true for using them overnight during the winter or all day in dry climates. Generally speaking, the human body feels best with a relative humidity above 30% and 60% and below. However, an ideal range for humidity in your home is 40-50%. Your goal isn’t to have it perfectly at some fixed number – that’s not realistic or necessary. The ideal amount of humidity is the level that you feel most comfortable at and resolve healthy and dry air symptoms for you, your child, or your home and family. A great rule of thumb is to aim for about 50%. When the level begins to reach 30% and below it’s time to use your humidifier. Severe dry air conditions begin to become obvious at about 30% and below. In dry climates and during winter the level can drop to under 20%! You might not realize it, but even allergy symptoms are less bothersome if the air is kept to a healthy moisture level as I mentioned above. That’s because dry air allows allergens to become more of a problem as well as move about more freely. Checking humidity is actually very simple if you’ve got the right instrument. 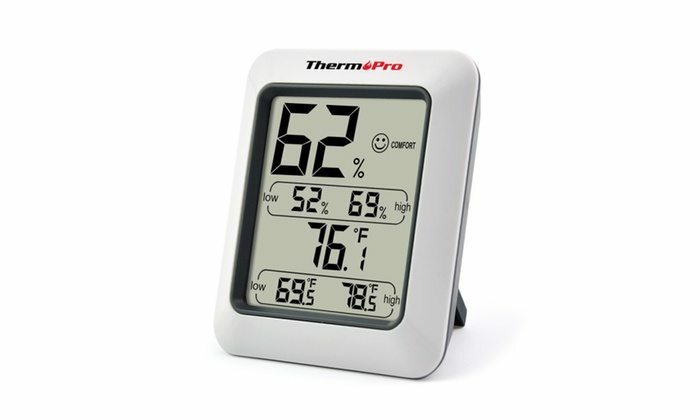 Fortunately, these days you can check both the temperature and relative humidity at a glance with a cheap meter like this fantastic little ThermaPro digital humidity gauge. Unfortunately guessing is a terrible way to try to figure out the condition of the air around you. To make matters worse, our bodies are subject to fluctuate in how they sense temperature and other conditions. While there are a few old-fashioned methods including using mechanical devices, in modern times it’s best to se a digital humidity gauge to check. As humidity is related to temperature it’s much better to be able to see both anytime you need. That’s another reason these modern (yet affordable! Many are under $15) instruments are wonderful to have around. I own several both at work and home. You’ll be able to see the relationship between the rise and fall of temperature and humidity accurately any time of the day or night. While they’re often a bit similar in how they look from the outside, there are some important differences to know. Warm mist and cool are quite similar with some distinctive differences. Evaporative is a best less common but also has some advantages the other 2 don’t have. 1. Warm mist models produce water vapor by using electrical power to generate heat and create a gentle, low-temperature vapor that’s a form of steam. They’re ideal for colds, congestion, and winter time. The drawback is that they add heat to a room as the water mist released warms before it escapes the device. Additionally they don’t have a dial control like cool mist models and often have 1 or more fixed output levels instead. 2. Cool mist models typically use low-power methods such as an ultrasonic device to produce a super-fine mist at room temperature. They’re great for saving energy as well as particularly well-suited to dry climate use. 3. 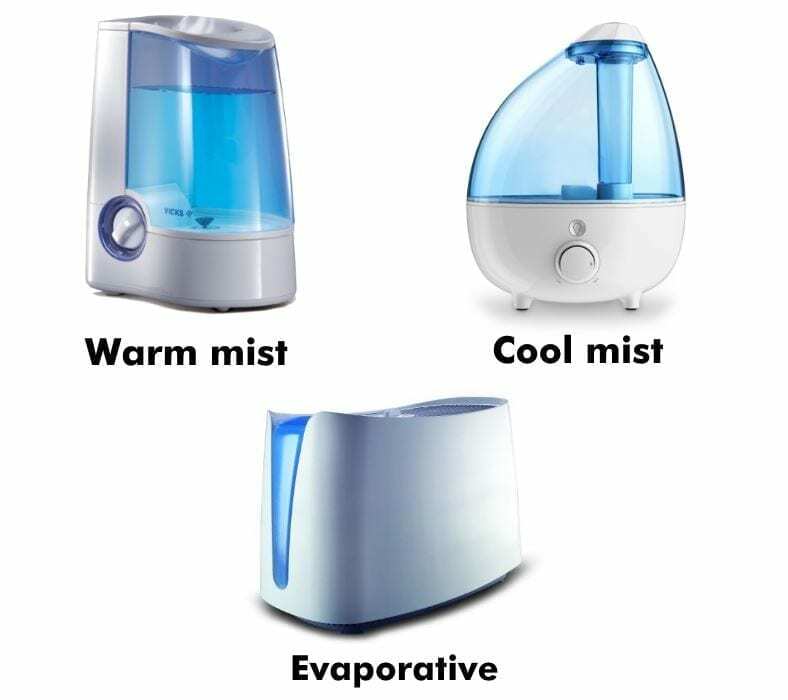 Evaporative humidifiers work just as you might guess: water evaporates (aided by a fan) with a special design intended to raise the humidity in a room. One distinct feature is evaporative humidifiers cannot raise a room’s humidity level too high (above 60%). It’s impossible as they only release moisture that naturally fills the void left due to low moisture thanks to the laws of physics. The great news is that the same guidelines apply for your child’s room, too. One of the best types to use, by the way, are those like a child’s cool mist model that’s highly adjustable. Additionally I recommend picking up a quiet one to let your child sleep peacefully. Need some advice on the best models worth buying? 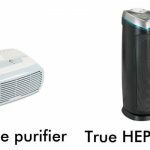 Check out this helpful guide featuring the best humidifiers for your money. They’re especially great for cough or dry skin relief. Honeywell HPA 300 Review - Check It Out!